After Venezuela, the situation in Nicaragua is producing a second migratory crisis in Latin America due to political and economic factors in the country. More than 155 days of protests against the regime of Daniel Ortega and his wife Rosario Murillo demanding their exit from power have unleashed an unprecedented crisis: the migration of thousands of Nicaraguans as a consequence of an escalation in violence, indiscriminate repression and economic contraction. After the heavy-handed reaction of the government, the protests have come to an end, but the government has unleashed a harsh wave of repression over its leaders, who were previously identified by secret police during the demonstrations. According to the Nicaraguan Association for Human Rights, 488 deaths were produced in the first 100 days of the crisis although official figures are much lower. Nicaraguans who are leaving in their thousands consolidate a long history of migration: 20% of the Nicaraguan population already live abroad. This diaspora is nothing new and it has a cemented history within the region, however over the past few months a new wave of migration has emerged, with around 200 asylum requests daily in Costa Rica according to UNHCR. Since the crisis began more than 23,000 asylum requests have been made in Costa Rica. Repression of protests in Nicaragua has undoubtedly affected young people the most, among these are many students and activists who led the mobilisations, and have consequently become targets of paramilitary groups that have re-emerged due to protests and shady government operations. The stories of shootings and murders by hooded gang members on motorbikes that have spread across social media are harrowing, and it’s becoming increasingly clear that the objective of these killings is to silence and intimidate the protagonists of these protests against the regime. After Costa Rica, Panamá is the next destination that has taken in large quantities of young migrants between the ages of 16 and 25 who are searching for better opportunities and a more stable political situation. The intention of the regime to silence and expel these young people who dare to raise their voice against it is clear, but international assistance is slow and it has taken a step back while the government attempts to reach a consensus with its opponents. The warnings of the International Organization for Migration (IOM) and UNHCR however leave to doubt uncontested: we are facing yet another potentially devastating migratory crisis. One of the main consequences of these migratory waves is the growing levels of xenophobia particularly concentrated in the border regions. 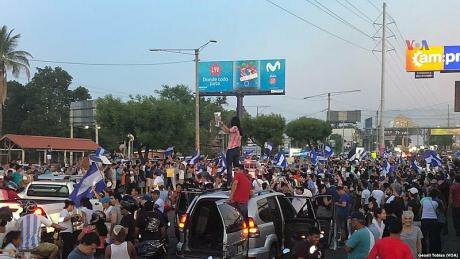 In San José, Costa Rica, groups associated with right-wing ideologies and football teams that gathered to protest the arrival of Nicaraguans embody the problem of how mass migration waves generate feelings of exclusion and xenophobia in receiving countries. We are dealing with xenophobia on a regional level that has produced a spill-over effect in countries such as Brazil and Colombia where groups aggressively reject Venezuelan migration, or Ecuador and Peru where governments have tried to close off their borders to curb the migratory wave. Feelings of xenophobia can be easily manipulated by aggressive groups with a political agenda, who have a significant capacity to increase tensions and provoke the exclusion of migrants. This phenomenon fuelled by hatred that could become extremely dangerous if not managed properly, and it should be monitored so that violence does not escalate. Fake news threads have already appeared reporting that Nicaraguans receive special benefits in the country or that they have been reportedly seen burning Costa Rican flags, adding fuel to the fire. Xenophobia provides justification for those who seek to repress and adopt a hard-handed approach towards exterior relations, something that has been long desired by the authoritarian forces of the region.